A project for three dance artists who sought democracy in process: Paea Leach, Jo Pollitt, Sam Fox. Driven by Paea Leach but built equally, the process included power tools, cardboard houses, old unused costumes, three pink rolling chairs, yellow cellophane and thousands of forks. 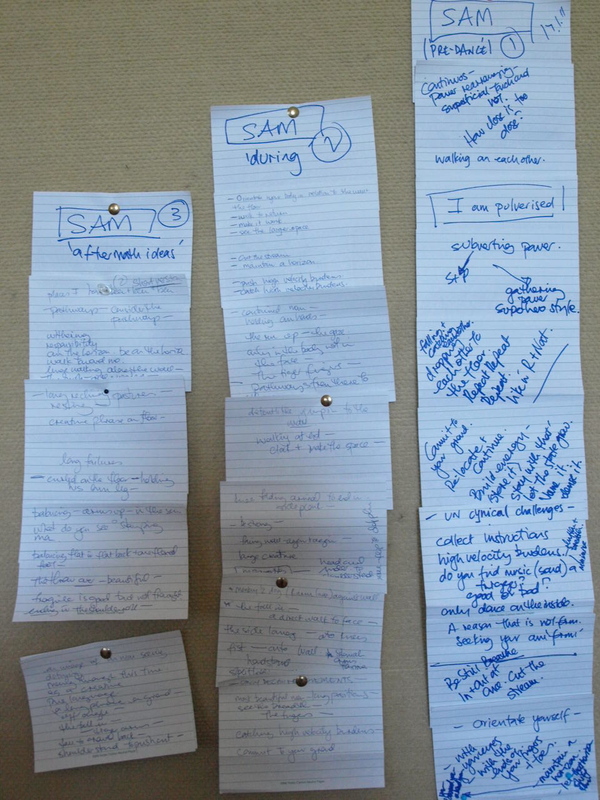 WRITING at the same time on the same page became a feature of the process. Below is the MANIFESTO for the work that wanted to address ideas of loss as economic, political and personal - 'obvious' loss and that which has no words. Presented at CIA Studios - Perth, W.A January 2011. We considered looking at our worlds through pinholes – as though experience could be pushed out through small tack holes on a map. It is a map with girth - imagine it (‘how big is a five year old sky’). The map is not just land mass. It is also marked with people and story and love and loss and trains to Paris and new - born babies and buses to detention centres and letters in Swedish arriving in the Australian desert. People wait in the desert, indeterminate time.